My "Custom" Fender Stratocaster ! 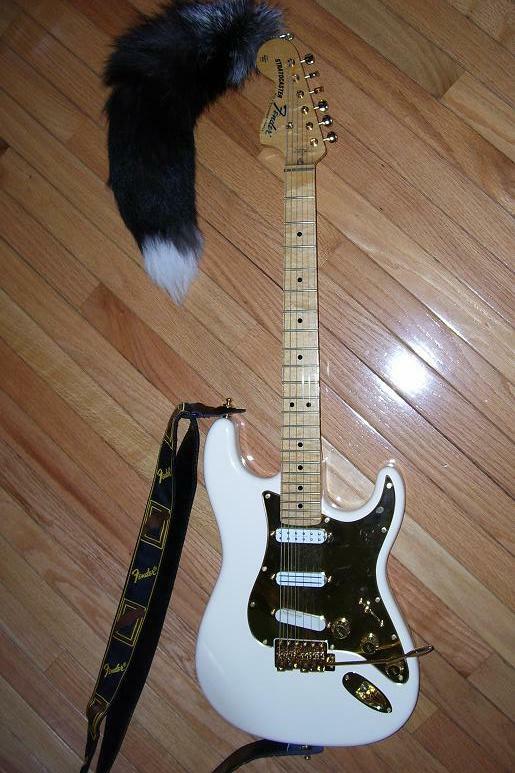 This is my "Custom" Fender Stratocaster. I designed this Fender Stratocaster in November, 2005 and had it delivered to me in March, 2006. All hardware is in GOLD. Fender CBS (69) MAPLE neck with large headstock and "curved 60's Fender Strat logo", it also has the small 'Fender custom shop' logo on the front and a larger one on the back of the headstock. The neck is Fender C shape (very thin) using 6130 'medium jumbo' frets. These frets are wide but low profile offering improved string bending, harmonics and sustain as well as a lower action. The truss rod is top accessible fitted with the usual Fender skunk stripe at the back of the neck. It is a "left handed neck" to be used right handed so the dots on the side are on the right-players side, but the headstock of course is reversed. It has an extra fret too, 22 frets (versus the normal 21). It is a 4 bolt neck plate with my initials in Fender font 'T J M" engraved, with an engraved wreath around it. The machine heads are the older (more reliable) slotted Kluson in GOLD. 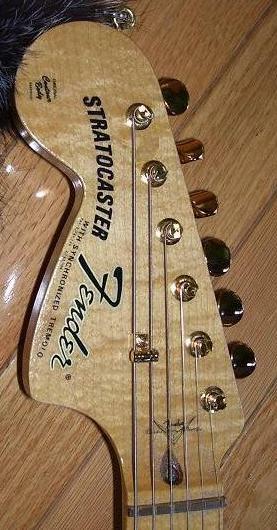 The single string retainer on the headstock, (butterfly) is also GOLD but the roller type for improved tuning and sustain. 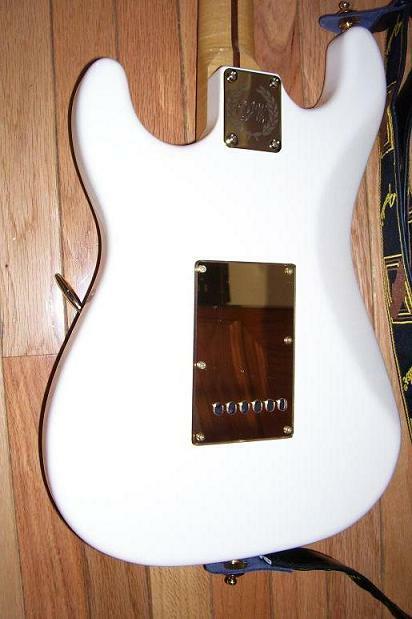 The body (in Vintage White) is made of Mahogany and weighing over 6lbs (versus the usual Fender Ash or Alder wood, weighing 3lbs), I asked for this because I wanted more resonance/sustain. It is a comfort contoured the way the 62' strat' was with slightly deeper routing for the electrics, all the routing is covered in copper tape for noise/hum canceling. 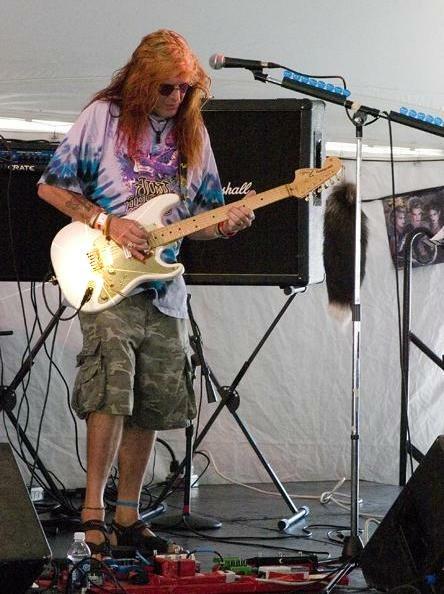 The bridge/tremolo system (right handed) is a 5 +1 hole vintage Fender type in GOLD but is is designed by Trev Wilkinson (he was a consultant to Fender on the Fender Tremelo systems throughout the years). Trev Wilkinson licensed this Tremelo bridge to "Gotoh", and it offers incredible tuning stability, more sustain with a lower profile, giving the ability for me to rest my hand on the bridge. 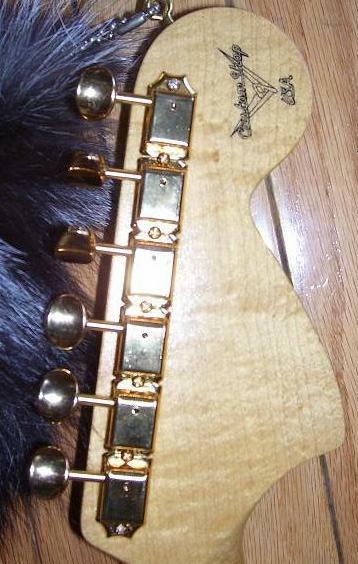 The saddles lock into place and the intonation uses small black shrub scews. It has a gold tremelo arm that is of the pop-in type, very useful and handy and far superior overall to anything Fender uses on the typical strats. Incidentally, the tremelo bridge, spaces the strings at the now popular and optimized 10.8mm spacing, keeping both E strings inward on the neck and very handy to avoid the usual and common Fender E string slippage when bending. 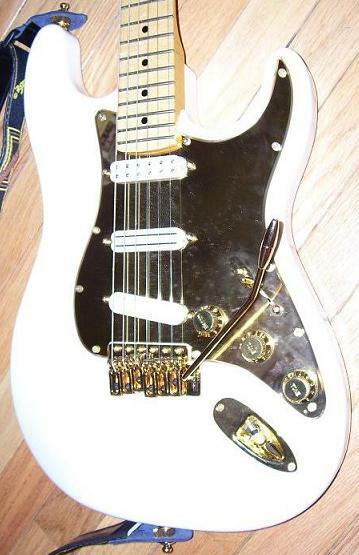 The pick-guard, knobs, switch tips and back plate are in Mirrored GOLD. The tremolo springs are fitted with five of the extra heavy type. The nut is a Brass nut type (like Malmsteen's) for extra sustain. The POTS are 500K (versus normal Fender 250K) to get more punch from the pick ups and improved tonality. Each control is a Volume control for each pick up (no Tone controls) but can be intermixed to be placed out of phase on pick up positions 2 & 4. I can turn pick ups on/off if I want with this wiring system (like Van Halen does). It uses a CLA 5 way pick selector (the best there is) in GOLD as well as the Jack receptacle. Neck- Seymour Duncan Humbucker Lil' 59, a HOT pick up that gives a cleaner sound than most and nice with overdrive. Bridge- is my favorite, a HOT Fender Lace Sensor RED, that is about as good as a Fender strat can sound using this. All Pick ups are hum/noise canceling. Finally, small details like locking strap nuts, all screws etc.. and of course, are in GOLD. One would ask "How does it sound, does it play as well as it looks?".. the answer is YES!!.. played acoustically it sounds much superior to that of a normal Fender strat and when used through my amp and effects board, the design ideas I used equaled what I wanted to achieve, which was basically a Fender strat that was easier to play, to have more sustain, improved tonality, better harmonics, and the extra fret. When using the tremelo arm (whammy bar), it will stay in perfect tune. With the exception of soldering the electrics and brass nut slotting/fitting (My guitar tec did that), I put this entire custom Fender strat' together myself, screw by screw and piece by piece. 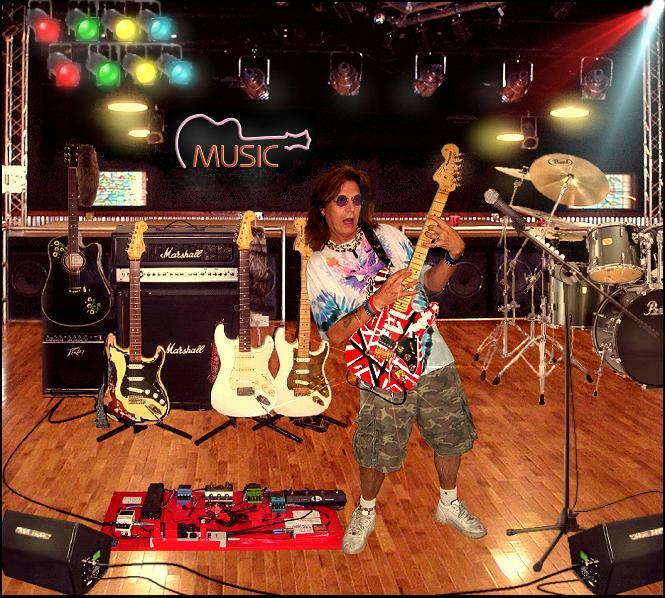 There were four guitarist styles in mind when I designed this custom Fender strat', Jimi Hendrix of course, Eric Clapton, Yngrie Malmsteen and Eddie Van Halen. 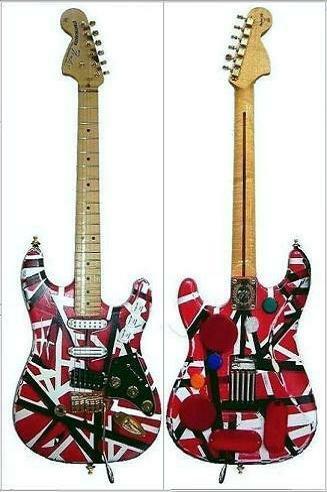 I recently custominzed (2008) this same 'TJM' strat' to a replica of Eddie Van Halen's 'Frankenstrat'. To do this I had a larger caivuty routed for the bridge pick-up and then, had it re-wired with an SH12, Seymour Duncan, 'Screamin' Demon' (George Lynch) Bridge pick-up wired as a humbucker. I cut the pickgaurd, and re-sprayed several times. Added some reflectors at the back, reset the tremelo and then added heavier trem' springs. I had the frets filed and the intonation set for a semi-tone down. Very very nice to play! !